Mike Huckaby, a pioneering American DJ and Producer, has been releasing music since the early 90's. He's among the most respected people in underground dance music scene as well as in his hometown of Detroit. His style is unique and varies from Deep House to Dub Techno infused with that special Jazzy, Detroit-soul, realness. Aside from contributing tracks to well-established labels like Third Ear or Sushitech, and regular visits to top tier clubs around the world, his new EP on his own label, S Y N T H, is yet another display of his distinct talent. A straight-up loopy, 11-key sequenced track, "Bassline 88" has this melodious repetitiveness that's haunting yet appealing. Yes, it's very repetitive, but so what, it works. He switches it up by surrounding the track with, what sounds like, different 808 drums patterns and claps. 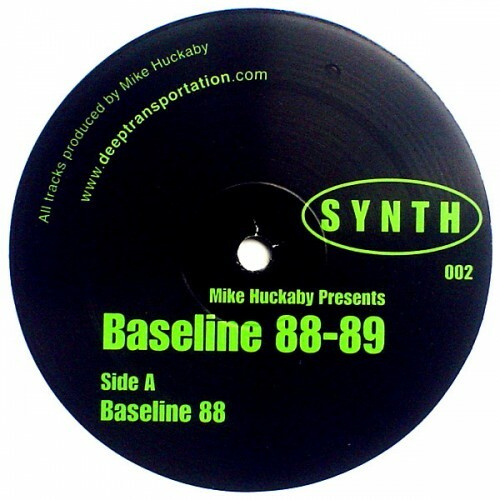 It's quirky in it's own way, but the track that really excites is "Bassline 89". Sticking with the repetitive theme, "Bassline 89" delivers on an infectious, hypnotic groove that forces hip shakes and shoulder wiggles. There are some percussions and vocal cuts in there to add some spice and energy to the song, but you're already caught in a trance with that analogue groove. Raw, catchy, energetic, and again, infectious! This EP is vinyl-only and limited release. Sorry kids, gotta sought this one out.